Wordless Wednesday — As the Labrador Sleeps, Mr Fox Creeps! Some of you might have missed my video of this fox’s close encounter, as a cub, with a certain Labrador. You can watch the video and read the story surrounding it here. But still smaller than his grey-muzzled Dad who has teeth as huge as the Big Bad Wolf in Red Riding Hood when he yawns! Gees….Do you live in a Nature Preserve? Sort of … bordering an official “Area of Outstanding Beauty” which begins at the top of our road with the woodlands leading up to the South Downs. 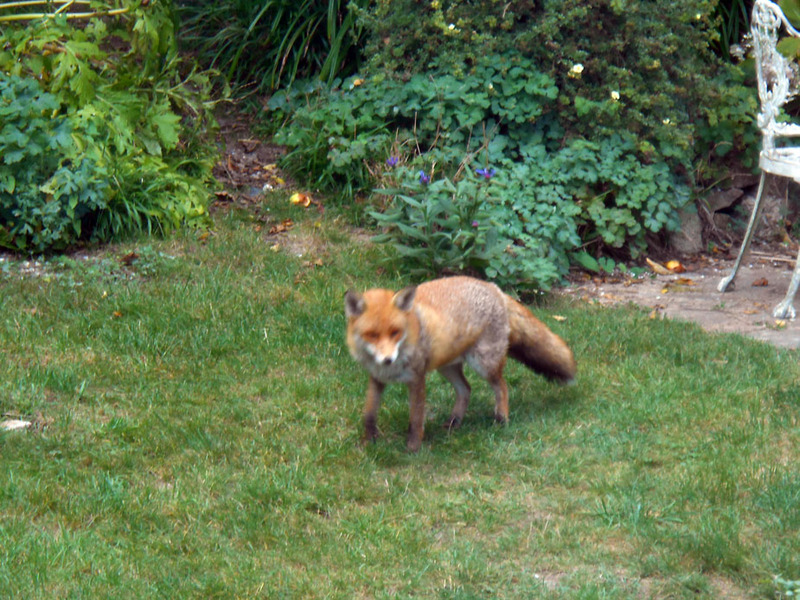 The foxes are well fed around here, as they travel daily between the urban and the rural. I had, indeed, missed the video so went to watch. Fox, indeed is a wild animal and not cute and cuddly, yet beautiful and graceful. We had one appear outside the van in the Juras area of France, while sleeping in the woods. It felt very magical to have one wander so close to us but that’s because we were safe inside the van! When I filmed that cub, it really drove home just how wild such creatures are. Cornered and terrified, it would have fought to the death with its needle sharp teeth, if it had had to do so. I certainly wouldn’t think of getting all cuddly with a creature like that. My mother once went to rescue an injured squirrel lying stunned in the road and it latched onto her finger with its teeth, giving her a very nasty bite that required her to have a tetanus injection. Yes, she’s a very well behaved dog. Glad to hear the mum came to rescue her cub. Poor thing must have felt quite lonely whilst waiting for its mum. I tend to see fox’s in a fleeting manner, slipping through mist laden gardens or country lanes. It’s pretty cool to have seen one up close, and points to your dog for its patient curiosity. I think the poor cub was very frightened, even though it appeared feisty on the surface. It was making frightened little whimpering sounds between the barks. My dog is very patient, although she does also see it as her job to see off what we call marauders as a collective title for foxes, cats, and squirrels. She thinks she’s guarding people and her territory. We did have to discourage some foxes from having their den under our garden shed, or one very cross Labrador would have kept us awake every night barking at an entire fox family playing on our lawn. I hope the chickens are safe!! Love the photo!! No chickens. Only imaginary ones. I think my dog would see them off as marauders, too!